Take a look at the inside of our condo featuring a Tommy Bahama master bedroom set. Learn more about the Kiahuna Planation Resort amenities and our condo amenities. Nestled between the Sheraton and Marriott Waiohai, sits the Kiahuna Plantation Resort on 35 acres of pristine gardens and #1 Poipu Beach just 20 minutes from the Lihue airport. The gracious plantation style architecture is fully restored, yet the Kiahuna Plantation resort retains its laid-back ambiance and old Hawaiian charm. This low-rise, vacation condo sits in a desirable location and adjacent to sunny Kiahuna Beach on Kauai. 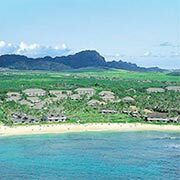 Your all inclusive vacation condo home is steps away to one of the best swimming beaches on the island of Kauai through landscaped gardens and the Great Lawn, the showcase of the Kiahuna Plantation Resort. Situated on 35 acres of expansive tropical gardens. Cooled by a gentle tropical breeze, the pristine blue Pacific ocean laps gently along the sandy swimming beach. A perfect place for a family vacation or a romantic getaway. Discover the story behind Kiahuna Plantaion and the history of Moir Gardens. 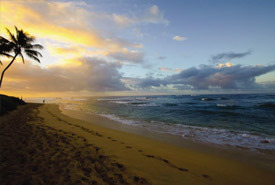 Find out more about Poipu Beach. Which is located at the edge of the lawn in the photo above. Yes, this beach is amazing. 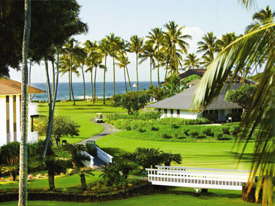 Kiahuna Plantation rated #2 among Hawaii's best resorts by Expedia Insider's Select of the world's best hotels for 2009. 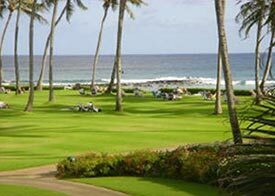 Only 20 resorts in Hawaii were included out of nearly 1,000 worldwide properties and Kiahuna Plantation was rated #2! This exclusive list represents the top 1% of the more than 80,000 hotels offered by this travel merchant, as rated by millions of customers and in-house experts.